From uprooted trees to ferocious waves, the California coast over the weekend was pummeled by a string of storms. 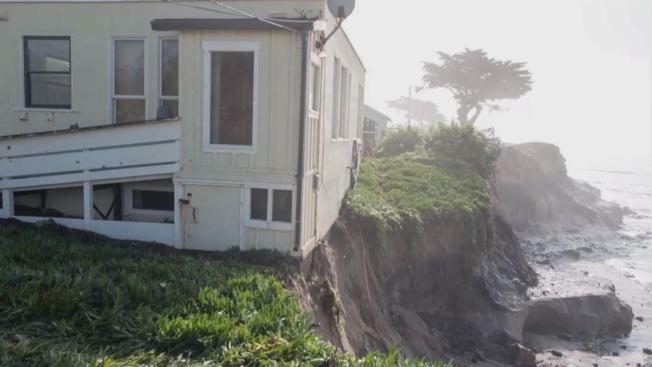 On the San Mateo County coast, erosion from the high surf continued to be an issue, as massive waves crashed over retaining walls in Pacifica and Half Moon Bay, damaging property on the bluffs and eroding the earth below. At Miramar Beach near Half Moon Bay, a state park ranger's house was literally on the edge of a cliff. The house is unoccupied, but the ranger was supposed to move in soon. Neighbor Gail Lamar, who has lived in a nearby building overlooking the ocean for the past 30 years, said the cliff below her building was shored up about five years ago. The ranger's house, however, was not part of that project. From uprooted trees to ferocious waves, the California coast over the weekend was pummeled by a string of storms. 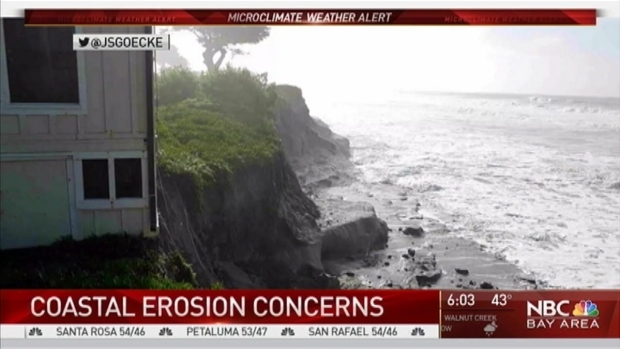 For example, a state park ranger's house at Miramar Beach in San Mateo County is now literally on the edge of a cliff. Kris Sanchez reports. "It’s just part of living by the coast," neighbor Brennon McKibbin said. "Everything falls into the water eventually." Many fear the popular walking path along the beach will be the next thing to be taken by the powerful waves. "I don’t know what the fix is," neighbor Gail Colella said. "Where does it end? It’s a long coastline." Until there is a permanent fix, some areas of the path are blocked off to keep people away from the vulnerable cliffs. The coastal path is maintained by the county. Supervisor Don Haggerty said the county is working on a plan to protect the path and the houses nearby, but he admits it could take years to get approval to design and build a retaining wall. On Sunday, employees working inside a Half Moon Bay restaurant received quite the shock when powerful waves decided to make a surprise visit. "I was just recording waves and then a big one came up and then a huge one hit the front of the restaurant and damaged the garden," Luis Valdez of Half Moon Bay said. Across the street, a group of people were enjoying a movie when a nearby tree came toppling down. "We were watching 'The Shining' actually, then we heard a big boom," Jeremy Harrison, a visitor to Half Moon Bay, said. No one was hurt, but the house did not fare so well. "The branch punctured part of the roof, then it popped out part of the inside ceiling," Harrison said. "Water then started dripping down." Cleanup is needed, but residents still have a few more days of wet weather in the forecast.